In this Dakota Hunter Blog, you will read about an insane plan that the Germans deployed in a final effort to break the imminent Allied invasion of their homeland. 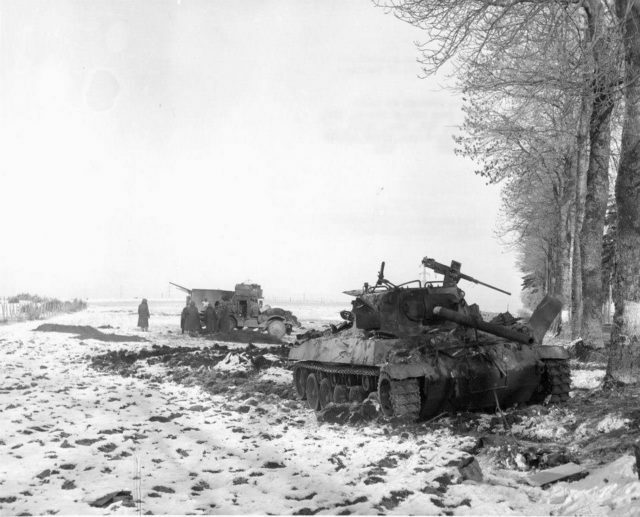 This Ardennes Offensive aka “The Battle of the Bulge” took place just 5 months before the Third Reich would completely collapse in April 1945. While all military fronts around Germany’s borders from the West and South were about to be squeezed to inside the German “Heimat”, a most daring (or rather a desperate) counter attack with SS panzer divisions and Infantry was launched from the Ardennes in Luxembourg and Eastern Belgium. Their major mission was to slice through the Allied forces with the element of surprise and the poor winter weather, hopefully keeping the Allied Airforces on the ground for a couple of days. In such optimistic scenario, they imagined that the German Army should be able to sweep via Brussels to the harbor of Antwerp, in order to keep that seaport out of Allied hands. And consequently cut off the supplies to the combined American, Canadian, and British troops that had reached in late summer of 1944 the provinces of Zeeland, Brabant, and Limburg in the south of the Netherlands. With no more air superiority, this German “Blitz” attack seemed very unrealistic to ever be accomplished according to plan. Even for some high ranking German Officers, the plan had the “desperado” features of a near Kamikaze assault, akin to the array of mad military operations that had earlier escaped from Hitler’s twisted mind. Imagine, the planned German penetration into the enemy-occupied territory from Bastogne to Antwerp had a distance of more than 200 km/ 120 miles! The outcome of this “Battle of the Bulge” must have been very harsh for the German troops involved and for the megalomaniacal Fuhrer. Allegedly, he suffered from a rapidly deteriorating mental health with depressions and attacks of extreme rage. His pride, the German panzer troops were well-trained and fanatic soldiers with superior tanks but their backup plan was lousy or rather non-existing. Consequently, they ended at only 25 % of the projected distance, at some 50 km west of Bastogne. There it was that their once much-feared War Machine creaked to a halt. Even before they could reach Dinant, their tanks ground with empty fuel tanks. And not only lack of fuel, also ammo, food and no chance at all for any aerial supply droppings for the relief of their miserable situation. Worse, a whole lot of shaking inflicted by the British, Americans and French Armies would soon come over them and they let them suffer to the max. The Battle of the Bulge was over in a matter of 3-4 weeks but left a large number of casualties that virtually were in vain as the downfall of the Third Reich was irretrievable. The photo above is taken during my last visit to the Chateau Rolle on 14 August 2016. It shows from left to right: the stables and the houses for the servants , guards and farmers, the central courtyard with the big tree, the Chateau with the tower at its left hand side with the chapel , the water well and finally, in the far right, the ruins of the Donjon, a medieval Defense tower with thick walls and cellars. A stunning location and unique Castle, the historical site was built in this form in the 16th and 17th Century. My Blog will focus mainly on what happened around this Chateau Rolle (or Rolley in French), just a few miles Northwest of Bastogne, well-situated on a hilltop and surrounded by dense forests and lakes. It was selected as the top location to serve as the US Army Command Post and became during the legendary “Bastogne Siege” (20-27 December 1944) the priority target of a German assault with seven tanks and infantry. The defense of the Chateau Rolle was assigned to a legendary Regiment: the 101st Airborne Division or Screaming Eagles, one of the most decorated formations of the U.S. Army. 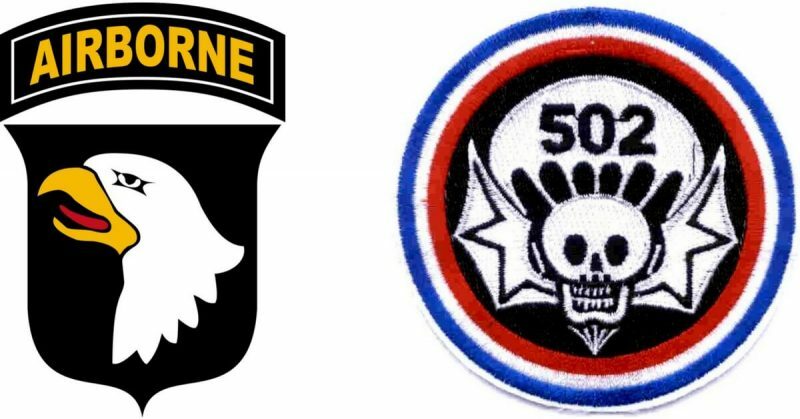 Below you’ll see the logo/ patch of that Division plus at right, the one of the 502nd Parachute Infantry Regiment (502nd PIR), which was assigned as a regiment of the 101st Airborne Division, That 502nd PIR had also performed so outstandingly in Normandy, in early June 1944. At the start of the D-Day invasion, their mission was to destroy a German battery of 122 mm howitzers near Ste Martin-de-Varreville, close to Utah Beach. I visited that site many times during my 10+ years pilgrimage trips to Normandy and was impressed by the audacity of that assault against a gun battery on a steep hill. I revisited this privately owned Chateau Rolle following an invitation from the family of my son-in-law. His family owns this historical site with the beautiful “Chateau et Domaines” since 1878. 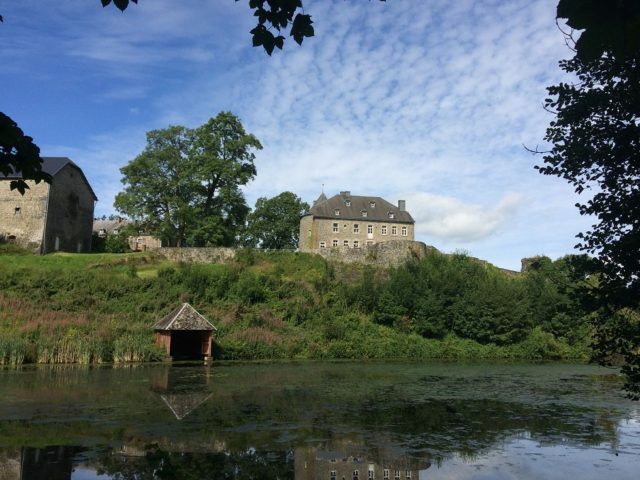 The Castle and its vast acres of land are not open to the public, so see the rare photos of this awesome place. It was also in this Castle that I found a remarkable book, named “The battered Bastards of Bastogne”, published by Publisher Casemate USA in 2003. They are also the Publishers of my book The Dakota Hunter (2015) and gave me the permission to copy a number of photos, captions, and excerpts from that Bastogne book that I found. That is much appreciated, as the author, George Koskimaki, gives in this book a perfect “Chronicle of the defense of Bastogne, December 19, 1944- January 17, 1945“. 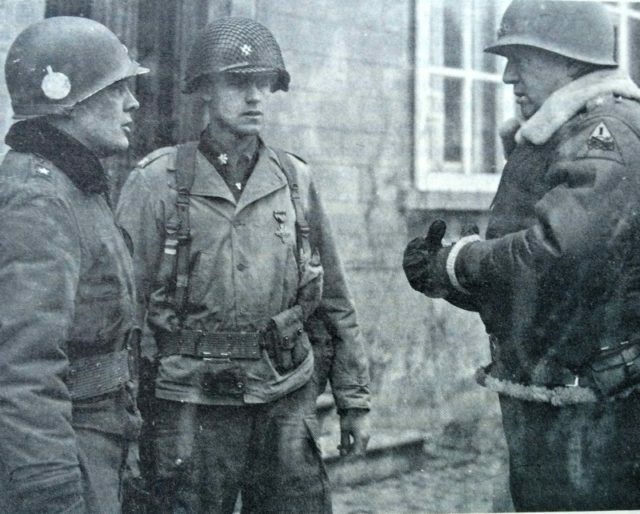 The photo above shows Lt. Gen, George S. Patton Jr., (right) chats with Brig. Gen. Anthony C. McAuliffe and Lt. Col. Steve Chappuis (center), after awarding them both the US Army Distinguished Service Cross for their defense of Bastogne. Note the front entry of the Chateau Rolle in the backdrop with that typical white window frame, as still exists. According to the book, General Patton was very pleased to come over to the chateau and saw the charred remains of the German Tanks that were knocked out by the 101st Airborne Division during the attack on this US Army Command Post on Christmas Day 1944. (photo taken by Capt. Joseph Pangerl, December 30, 1944). The Chateau Rolle was earlier selected by the 101st Airborne Division as their Command Post, due to its remote, hidden position yet very close to Bastogne. The complex with its many houses and stables served not only as a Command post with all Radio Communications but also as barracks for the soldiers (101st Airborne /502nd PIR), as an infirmary for the wounded, as a kitchen and weapons depot. Once the siege was broken, General Patton came over to honor the US troops that had achieved the unthinkable, by stopping the German Tank attacks and rejecting to surrender as was being asked by the German Generals. Instead, the legendary message “Nuts” was given as a reply by General Mcauliffe (see photo above). His troops were able to sit out the battering and knock out the tanks that came in. Relief came their way with aerial droppings and finally, Patton’s Army was able to set them free. With the massive annihilation of the German Tanks and Infantry, the “Battle of the Bulge”ended as a disaster for the German Panzer Army. Here follows an excerpt from the book: It is written by Captain Joseph Pangerl in a letter to his parents December 30, 1944: “Just now, I am in a beautiful 17th-century castle which also serves as my home. It has been modernized but, naturally, still has the three-foot thick walls all around and you know what that means in combat, dad. In front of the castle is the former castle: this one of the 10th century. The first days here I spent quite a lot of time going around taking pictures. The setting here is much like a Hollywood one. We are on a small hill with hills all around us, covered with pine forests. There are the small lakes and rushing brooks that you always associate with such a setting and the fact that it snowed over a week ago and all the snow is still on the ground makes everything look like a Xmas postcard”. He also describes the surprise visit that General Patton made to the Chateau. See the photo on top. Two Top Brass Soldiers were at the Chateau, the 502nd Parachute Infantry Regiment HQ when the General arrived to award its commander a DSC and to inspect enemy tanks which had been knocked out near the chateau. Capt. Joseph Pangerl: “ This afternoon we had the pleasure of General Patton’s presence. He came right out of the castle and pinned a medal on our Colonel, for we were the regiment that finally stopped the last big German effort. I was waiting for him with my camera outside and as I took his picture he walked over toe me and said, “Now get a good one”. 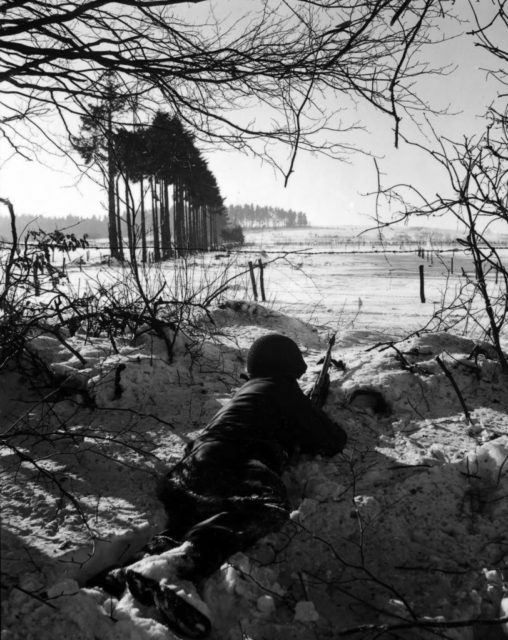 The photo above depicts a typical winter scene in the Ardennes near Bastogne. Open fields, dense pine forests, cattle fences and ditches. It was not easy to dig foxholes in the frozen ground during the very harsh winter of 1944/45. The peaceful view of this picture could change in a matter of seconds , as was described by Lt. Henry Barnes in his harrowing report from the Chateau: “The noise of firing, explosions, and shriek of incoming shells increased with daylight. A medical officer ran over to me and told me to get ready to burn all our medical books of tags so the enemy couldn’t know how many men we had lost. Everyone was running around: suddenly the courtyard was cleared and most of the able-bodied personnel followed a captain down the road and took up defensive positions along another road. Here it was Christmas morning in a Belgian Chateau with a room full of wounded and outside all hell was breaking loose. I glanced at the wounded and smiled comfortably and went outside behind the chateau and relieved myself…..The shooting was just outside the wall and the sound of grinding tanks could be heard. We heard there were seven tanks outside with about a company of infantry…..A shout caused me to run back into the aid station and on our walkie-talkie, a shrieking voice shouted in German, filled the room with discordant sound. Our medical officer listened in disbelief and said that it must be one of the tank commanders outside giving orders. It shut off and left us bewildered. Back to the wounded I went and told them what was going on and said I would stay with them when someone ran in shouting “We’re getting them!”. I whooped with delight and ran down the slope. Four German tanks were in flames”. The photo above shows the map of Bastogne in the center while being surrounded by the SS Panzer Units. The great final German counterattack against the Allied Forces outside their Homeland had started by mid-December 1944 and came as a total surprise. The 101 Airborne Division that was defending the Bastogne area soon found itself beleaguered by those German Tank Battalions and Infantry. Their situation soon became precarious as it was no longer possible to get sufficient supplies of food, fuel, ammo and medicaments for an ever growing number of wounded soldiers. 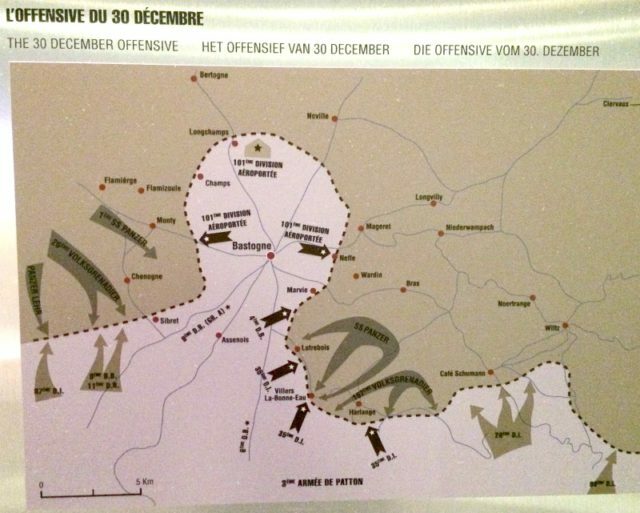 The siege of Bastogne lasted for a week from 20-27 December 1944. Patton’s 3rd Army broke the “Ring of Fire” on 27 December from the South. The map is reflecting the situation on 30 December 1944. The Chateau Rolley is only 1 km east of the little village Champs, seen on the map northwest of Bastogne, very close to the frontline of the American held “pocket” and was already attacked by the SS Panzer Tanks on Christmas Day 1944, one week earlier. 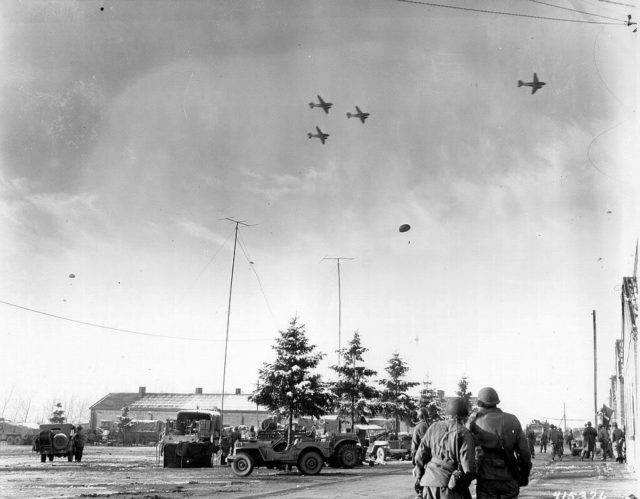 The photo above shows the relief droppings from the C-47s over the surrounded Bastogne pocket. It was one of those C-47’s that did a low fly pass for a dropping on Christmas Eve, 1944 and was shot at by a German light caliber gun. One (un)lucky bullet penetrated the lower fuselage just aft of the cockpit and hit the radio. Its operator was puzzled to notice that his radio quit but he was unhurt. More about that awesome story in my next blog, where you can read about my search in the Florida Swamps for that particular C-47, that flew for years as a Mosquito Sprayer. With the help of my friend Bart Nopper and Roland Korst, we found the aircraft, including that patched bullet hole and a whole lot of Wartime documentation! With the local wrench jock Kenny, we cut off the cockpit, transported it to Holland for a Star Display in the Museum “Wings of Liberation” in Brabant, The Netherlands, near Eindhoven. Read my next week’s Dakota Hunter Blog “Lucky Bastogne Veteran C-47 found back” for the full story and photos. Above a dramatic picture of a destroyed M18 Hellcat and M3A1 Halftrack in the backdrop from 705th Tank Destroyer Battalion which supported the 101st Airborne at Bastogne. 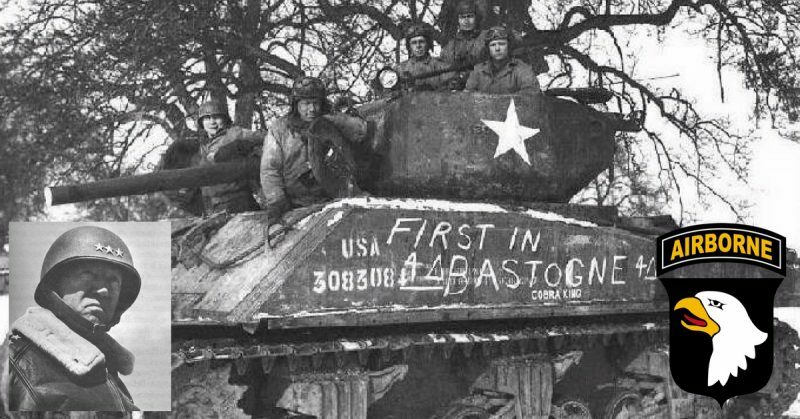 Allegedly, throughout the siege of Bastogne (20-27 Dec. 1944), the Americans shot around 40 German tanks and lost only six of their own. 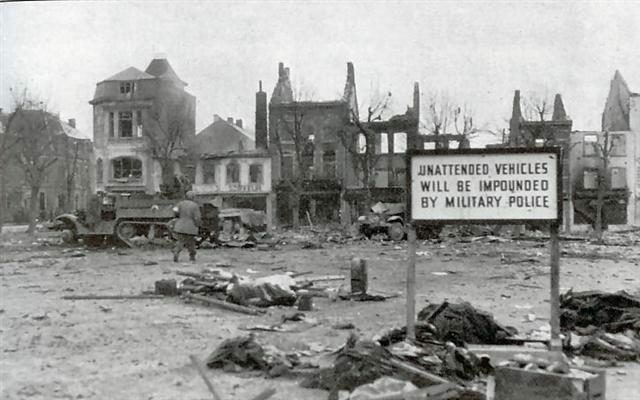 The photo above shows the devastation in Bastogne during the siege, right after the bombing. The German Luftwaffe was able to bomb the city on Christmas Eve by 7.00 PM with a limited number of aircraft that came in the dark from Germany as a sort of “finale” of their once famous bombing raids. Some 4 years earlier , the Junkers and Dorniers were much feared and ruled the skies over Continental Europe. But now, they came as killers in the night and although they could inflict a lot of harm and damage in Bastogne, it could never change the tide or their fate. The annihilation of the Luftwaffe and its originator the Third Reich was imminent. 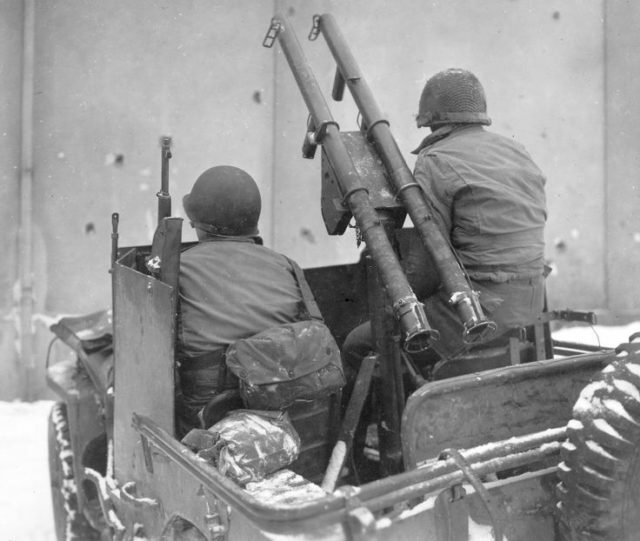 The photo above shows the Twin M1A1 Bazookas mounted on an “Anti-Tank” Jeep. It was the light-weight yet very effective Bazooka that helped save the Chateau Rolle from possibly a total destruction at the moment it was attacked by seven German tanks. As soon as the Germans had found out about the role of the Chateau as a Command Post, Weapons Depot, Hospital and Radio Communications center for the 101st Airborne Division/ 502nd PIR, they had good reasons to launch an assault from the little village Champs on this Chateau. But the resistance that came from the Americans was so defiant and gallant with a handful of men, light weapons, and only 3 Bazookas, that they were able to knock out the attacking German tanks and infantry that had arrived on the threshold of the Chateau. Probably, the German Tank Commander must have thought that with their firepower and Panzer, it was “easy meat’” to conquer the Chateau, maybe even with a capitulation on first sight of the approaching tanks. But, hélas for them, there was no capitulation. Instead, the US Soldiers dug in and countered with very accurate fire from guns, mortars, and bazookas. In no time the German tanks were disabled with broken tracks and their infantrymen were shot and killed before the tank guns could inflict any serious damage to the Castle. 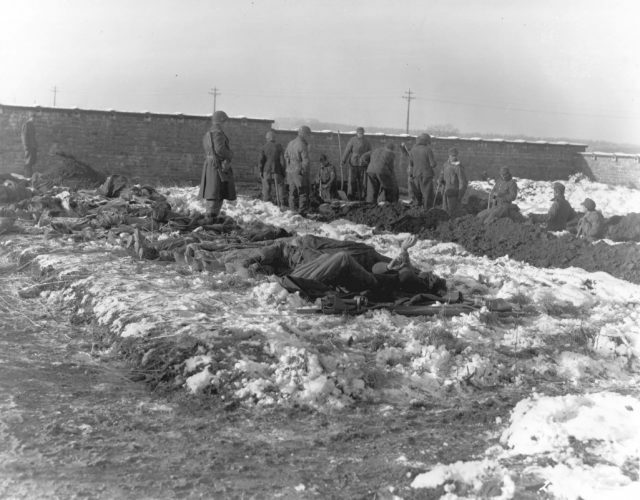 Read this report from the book: “They yelled “Germans are coming”- we’ve got to go out and dig foxholes and get ready to fight a war!” I went out there and it was like digging in cement. I got next to a hedge. Four Mark IV Tanks came and a couple of TD’s knocked out some of them and the rest were disabled by Bazookas”. As a member of the demolition Platoon of the 502nd Regiment, Sgt. “Sky” Jackson won his second Silver Star on Christmas Day in front of the regimental HQ when he disabled an enemy tank, part of the attacking force which was threatening to overrun that command post (the Chateau)…… “We had mined a bridge leading to the Chateau, but it was so cold that everything froze and we couldn’t blow it up. I ran out of the door and saw five tanks coming through the snow with the German infantrymen riding on them. I ran and got a Bazooka as the rest of our guys ran out and reinforcements started coming in from the town. I hit the first one in the track and knocked it out. Then we got the others and killed all the infantrymen”. The Photo above: German prisoners of war dig graves for members of the 101st Airborne Division who were killed defending Bastogne against the Germans. Signal Corps Photo . The 101st Airborne Division’s casualties from 19 December 1944 to 6 January 1945 were 341 killed, 1,691 wounded, and 516 missing. The 10th Armored Division’s CCB incurred approximately 500 casualties (source Wikipedia). 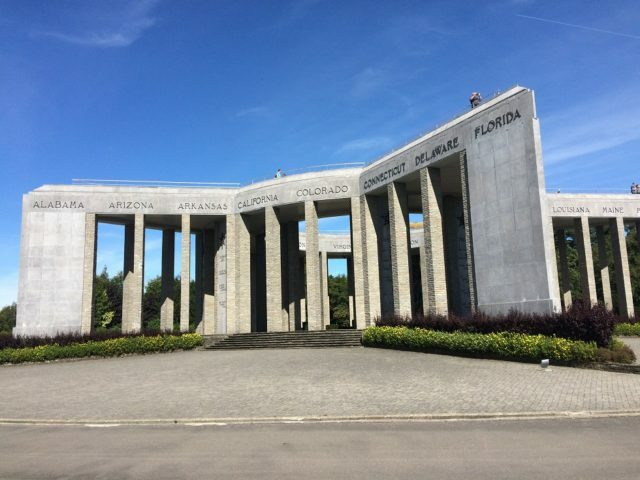 The Photo above shows the impressive War Memorial in Bastogne, situated on a hill overlooking the town. At left, out of sight is the new Bastogne War Museum, that reopened in 2014 with films and shows. It was a fascinating tour that I made to Bastogne. I can recommend this to all my Friends, to see this Museum and Memorial. If you come from abroad, I recommend a combined tour of Bastogne with Normandy, France. (see my earlier Blog visit to Normandy, for the D-Day commemorations June 6, 2016, with my “Old Timers” Harley Davidson Club). The Photo above depicts The Chateau Rolle seen from the lake. My youngest grandson Tommy came with me for a checkout of the lake for a possible hidden treasure. In the water well just next to the Castle, they had found weapons after the war that were most probably hidden there by the Americans as the attack with the Tanks began. The total surrounding of the Chateau remains a most romantic and peaceful site as if time had frozen here for ages. Thanks also to the 101st Airborne Division that this magic place is still intact!. A true Miracle was it to visit this hidden site in such good state. I have written a book The Dakota Hunter, in which I describe my adventures and my lifetime passion with War History and its Transports as the Jeep, the Harley Davidson motorcycle and vintage aircraft as the Douglas C-47/ Dakota and the PBY-5A Catalina. As a young kid I grew up in the post-war Borneo Jungle and was from Day One confronted with all those Goodies, in an environment that was littered with wrecks but also with operational transports left over from the Pacific War. Bunkers, stranded submarine & Landing Craft, crashed airplanes, unexploded bombs, Jap stragglers that popped from the Jungle, but also Jeeps and GMC Trucks all over the place in which my Dad drove around with his “wrecking crew” to get the oil-drilling rigs and derricks back to work again. His employer Shell came back in business right after the war and bought a couple of surplus PBY-5A Catalinas to fly us around the archipelago. Along with our frequent Douglas DC-3/ C-47 flights to Java, I can tell you that I had seven most fascinating years that left a “footprint” in my soul which never faded away. Playstation was not invented yet, but I had mine in the 1950’s, as I walked out from our house into the Jungle. As an always curious, exploring and adventurous kid, I had the time of my life on that Pacific Island (and never really lost that curious and exploring nature). A passion was born and that played up later in my life. I quit my job and went in search of the legendary DC-3/ C-47 on the last Frontiers of this World. Crashed , abandoned, on a boneyard, or still flying, I found them in all states of (dis)repair. But I also found the confrontation with the Military, or worse, the local Militia or Drugs Lords who use the DC-3/ C-47 for the transport of their “soldiers” and illicit trade. You can read it all in my book (see jacket design of the Dakota Hunter below). Selected from my lifetime adventures and encounters with vintage aircraft, I have collected the best stories in my book of 320 pages, engagingly written and illustrated with 250 unique photos. Meet the pilots, the remote communities, and the planes. 20 years of expeditions, in search of the legendary DC-3/C-47. I found them in the High Andes, The Yukon, Alaska, Honduras, Madagascar and the Jungles of the Amazon, where the Dakota still reigns as the only transport to bring you in and out of the dense forests of the Green Hell. The very last Frontiers of this world are out there, in Colombia. For ordering this book, you can go directly to the Amazon page by clicking here at Ordering at Amazon The Dakota Hunter Book, in print version or as E-book. For 5-star reviews of my book, scroll down on that Amazon page. More Previews and an array of my earlier Dakota Hunter Blogs are to be found at dc3dakotahunter.com. Also, you can order one or both books (in print- version or as e-book) via my publisher’s website. Click here for Casemate’s site. If interested, follow me on Facebook. Soon, I will come out with a Blog about an exciting new expedition and a web shop that will offer you some stunning & unique pieces of a C-47/ DC-3 for sale, made in Oklahoma in 1944. Finally, you can own your own genuine piece of a C-47, found, made and certified by The Dakota Hunter. Stay tuned!